The Soulfire Plateau is a necromantic worship site located in southern Auridon, southeast of the town of Phaer. 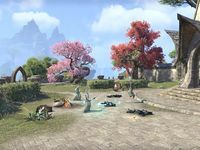 Several Auridon Marines have recently been killed by the three necromancers who inhabit the site, Quendia, Norendo, and Eraman. End the threat of the necromancers at Soulfire Plateau and avenge the First Auridon Marines.